In Public Lab, we believe that generating knowledge is a powerful thing. We aim to open research from the exclusive hands of scientific experts. By doing so, communities facing environmental justice issues are able to own the science and advocate for the changes they want to see. By promoting a hands-on, do-it-yourself ethos, we support each other’s exploration, which leads to technical development and real applications in our communities. Public Lab is an open community that anyone can join. We work online through this interactive wiki where people can pose questions, post their research and reach out to others. Research questions are focused on addressing local issues, and are driven by on-the-ground community work. This makes us stronger community organizers, technologists, scientists and activists. The science, technology and data in Public Lab are community-created and open source. We utilize our open data to advocate for better environmental management, regulations and enforcement. These tools enable people to more easily generate knowledge and share data about community environmental health. produce meaningful, understandable and high quality data. Public Lab was founded in the wake of the 2010 BP oil disaster. During the spill, there was an information blackout for residents of the coastal region, as well as the rest of the world. No one was accurately tracking what was happening on the ground. In response a group of concerned residents, environmental advocates, designers, and social scientists lofted “community satellites,” made from balloons, kites and digital cameras, over the spill to collect real time data about its impact. Local citizens collected the images, and through a newly created open source platform, contributors stitch over 100,000 aerial images into maps of the coastline before, during, and after the oil spread. These high-resolution maps were featured by BBC and New York Times, among others, allowing residents to speak their truth about what was going on in the Gulf Coast. The success of the grassroots mapping effort galvanized the group to found Public Lab as a new research and social space for the development of low-cost tools for community-based environmental monitoring and assessment. The Public Laboratory for Open Technology and Science (Public Lab) is a community -- supported by a 501(c)3 non-profit -- which develops and applies open-source tools to environmental exploration and investigation. 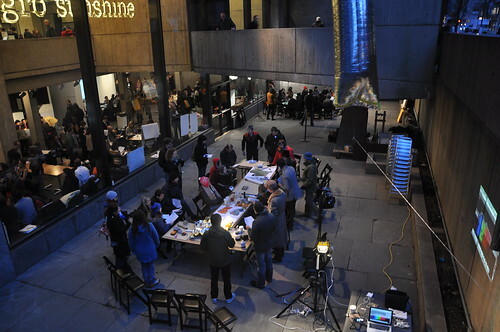 By democratizing inexpensive and accessible Do-It-Yourself techniques, Public Lab creates a collaborative network of practitioners who actively re-imagine the human relationship with the environment. The core Public Lab program is focused on "civic science" in which we research open source hardware and software tools and methods to generate knowledge and share data about community environmental health. Our goal is to increase the ability of underserved communities to identify, redress, remediate, and create awareness and accountability around environmental concerns. Public Lab achieves this by providing online and offline training, education and support, and by focusing on locally-relevant outcomes that emphasize human capacity and understanding. Contribute - how to participate in Public Lab. Public Lab Partners - links to the sites of Public Lab friends, collaborators and partners. Media - our publications, and press coverage. How Public Lab is Funded - a list of Public Lab funding sources. Public Lab on Twitter and on Facebook. Public Lab is a growing community that is open for all to join. However, there are thirteen staff and four board members that support this community. The best way to get in touch is by emailing our staff list at staff@publiclab.org. If you are trying to reach a particular staff member, please visit the Public Lab Staff page. Kits Initiative contact information If you need assistance with a kit purchase, please contact kits@publiclab.org. Technical assistance with website Please file an issue and we'll help as soon as we can. Our Initiatives - our main concerns and goals. Kits Initiative contact information If you need assistance with a kit purchase, please contact kits@publiclab.org or call 503-902-5874. Kit Initiative staff are typically available between 9am and 5pm PST Monday-Friday. Technical assistance with website Please contact web@publiclab.org. How Public Lab is organized. Public Lab is a growing community that is open for all to join. However, there are eleven staff and five board members that support this community. If you need assistance with a kit purchase, please contact kits@publiclab.org or call 503-902-5874. Kit Initiative staff are typically available between 9am and 5pm PST Monday-Friday. Public Lab is a growing community that is open for all to join. However, there are seven staff and five board members that support this community.